Set your '94-Current Ford Mustang apart from the rest with this customizable body side graphic set. Available in a wide variety of colors and is packaged with one (1) left and one (1) right side graphic. Choose from a graphic with solid continuous lines or customize it as shown with unique cut-out wording. Simply enter the Custom Wording of your choice (up to seven  letters/digits/spaces) and we'll make it happen. Either way it'll look Terrific! Designed to be placed approximately 1" (25.40mm) below the distinct body line as shown, slight trimming is required at rear door jamb and rear wheelwell opening of '10-'14 Mustang models. 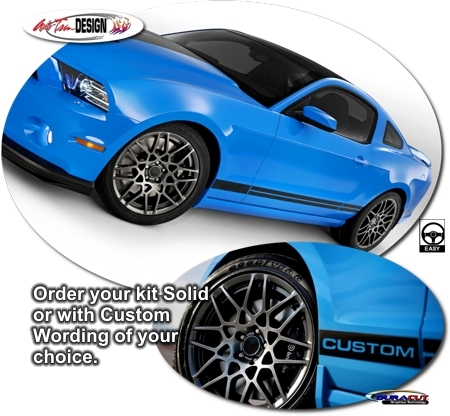 While graphic is fit for '10-'14 Ford Mustang Front Fender, Door and Rear Quarter areas, with slight trimming kit may work well with other year model Mustangs.